Whether you need to increase the Wi-Fi range for your office or home, these extenders can do the trick! While a router is a good starting point, you may need to increase your home's coverage area if you live in a big home, or need more Wi-Fi access spots. A Wi-Fi extender may not be necessary if you're just looking to get the maximum performance out of your router. Rather, adding an additional router or Ethernet connections can help infiltrate the weaker Wi-Fi zones. It's best to steer clear of single-band extenders as these extenders use the same exact band for both broadcasting it's own signal and connecting to the router, which can compromise performance. 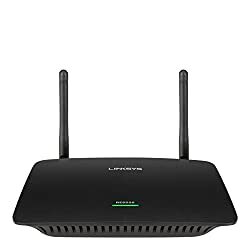 Consequently, it's better to use a dual-band router, which uses one band for broadcasting and the other to connect to your router. 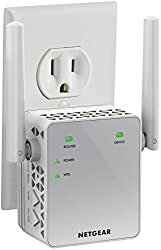 It might also be worthwhile to use a wired connection or additional router before investing in Wi-Fi extenders. If a Wi-Fi extender is still ideal for you, then you'll find some of the most efficient, best Wi-Fi extenders here. Also, each option will work with your ISP, including Spectrum, Verizon FIOS and Comcast. It's important to consider the kind of speed and coverage you need, as well as the connectivity methods. Each of these extenders can go a long way toward getting the best performance for your router. However, if it's a whole new setup that you're looking for than a Mesh Wi-Fi Network can be a great option that offers superb coverage. You may like also this list of the Best Mesh Wi-Fi Network Systems. For those who are looking for something simple and effective, this NETGEAR EX3700 has a lot to offer. It's a dual-band WiFi extender that is compatible with the most recent wireless standard when it comes to Wireless-AC technology. You'll also find that it's able to work up to a speed of 750Mbps as it creates improved Wi-Fi coverage throughout your home. The EX3700 is perfect for those who want to be able to create a separate network for guests, as on top of the signal boosting ability it also has the ability to make a new Wi-Fi access spot. All you have to do to create this hotspot is to use a wire-connected Gigabit Ethernet port. Using the NETGEAR Wi-Fi Analytics Application, you'll also be able to identify crowded channels and gauge the overall strength and status of the Wi-Fi signal. Therefore, this NETGEAR device is able to make all this happen using two external antennas and a lot of power in an inexpensive package. When it comes to versatile and budget-friendly devices, you really couldn't find a better buy than this NETGEAR device. Are you looking other options? check this list of best Netgear Routers. If you try out this extender, make sure it will work with your current router. Adds to your signal without a high cost. Some customers have trouble getting the extender to work with their router. In some instances, customers find there aren’t sufficient instructions. 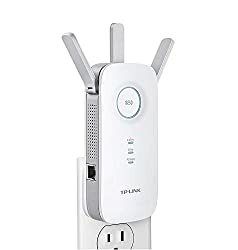 When you want to add to your connection without having to invest a lot into a Wi-Fi extender, then this is a fantastic option. 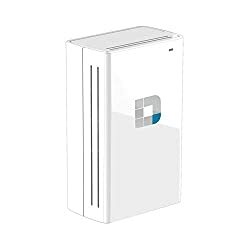 When you need to extend your router's coverage area and want a low-cost Wi-Fi extender to use, the D-Link dual-band DAP-1520 is an affordable option. To get this extender going, just plug it into the wall socket, then just push a button. Consequently, in no time at all you'll be getting a throughput up to a whopping 750Mbps (433 Mbps on 5GHz, 300Mbps on 2.4GHz) using the extender's Wireless-AC technology. Not everyone wants all the bells and whistles included with the more expensive options, and in those instances the DAP-1520 is the simple Wi-Fi extender for you. It's a fantastic extender for people who need increased versatility for your money without having to pay the big bucks. You'll be able to both save as well as restore the machine's settings which also makes it fantastic when you've gone through a power outage or even a factory reset. Furthermore, the DAP-1520 is an affordable gadget for those with limited technological know-how. Keep in mind that along with the simplicity and cheap cost, there are a few concessions to be made with this device. For example, there are no audio inputs or USB. There's also no Ethernet and no functionality like network bridging. If you're just looking for a device that is small, easy to install and offers minimal Wi-Fi extending then the DAP-1520 is the perfect device. On the other hand, this device isn't the most ideal for the networking wizard hoping to use it for frequent LAN parties or press conferences. Essentially, it's a solid device with an impressively strong wireless signal but your expectations shouldn't be too high if you're downsizing to a simple wall socket Wi-Fi extender like this one. However, it is ideal for monitoring the traffic on your network on top of getting a boosted signal in one inexpensive package. While most customers end up loving this extender, there can be relatively frequent problems during setup that require assistance. Comes with excellent customer service. Ensures WiFi “dead spots” are covered. Some customers find it doesn’t increase their range as expected. In some instances, it can cease working after only a few months. If you aren't looking for an expensive setup, but need dead spots covered or a signal boost then this extender is worth looking into. 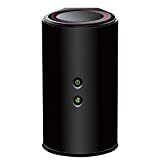 This NETGEAR EX6200 is a great Wi-Fi extender for those who want something affordable and versatile that also allows for a second available Wi-Fi access spot. Using the newest Wireless-AC standard, this powerful dual-band extender is a great option for extending your signal and also for doubling your access points. In addition, the 5GHz frequency and 2.4GHz frequency bands on this device are capable of up to 1200 Mbps of throughput to aid your current signal. The EX6200 also offers 5 Gigabit ports for Ethernet so you'll be able to connect to plenty of devices if needed. Due to a dual core processor and a fast Ethernet standard, this extender is able to offer optimal performance without an extreme cost. The 2, 5dBi antennas that are high-gain also work alongside the dual-band functionality to extend your router's coverage area immensely. Whether you need an extra wired access point or just a Wi-Fi extender, the EX6200 is quite speedy and sure to become a loved household tool. It can potentially increase the range of your signal by hundreds of square feet, and very friendly to both regular users and professionals. Due to its ability to operate on two Wi-Fi bands, allowing you to game, stream or just surf the net, the EX6200 has received plenty of stunning reviews. Therefore, if you need something to make your Wi-Fi faster or boost the signal, this extender is the perfect purchase. On today's market, this is surely one of the greatest multipurpose Wi-Fi extenders. It may be a little more costly than the AC750, but it backs that up with a high level of power and versatility. Some customers have experienced this extender dropping the signal to frequently, or ceasing to work. Does a great job of extending signal range for larger homes. Setup is simple and fast. Increases the power of your signal to avoid dead or weak spots. In some instances, the signal can begin to fail after a short period of use. Some customers find a less than ideal improvement to their Wi-Fi signal. If you're looking for a Wi-Fi extender with a great design, and affordable price and a high level of versatility then this is a fantastic option. If the middle of the road works well for you, this extender is a great option in both price and speed. The dual-band RE305 is not the fastest extender you might find out there, but it does have a fast Ethernet port that you can connect a wired device to easily. Like many other options, it does offer two bands made up of one 5GHz band (up to 867Mbps) and one 2.4GHz band (up to 300Mbps). While it may not be the greatest for close range, it is without a doubt one of the best extenders for long range use. Due to it's rounded edges and white color, you might even be able to call the RE305 cute. It's a very compact little device made to easily plug into your wall socket. The RE305 has three LED lights that help you to determine when it's working and two short antennas to assist with the signal. Another benefit is that the RE305 is a very simple device, and therefore setup is a cinch. Some customers can even get it properly connected in under 5 minutes. In contrast, if you should run into any trouble, you can easily get in touch with technical support for assistance or make use of the 2 year warranty backing this device. In a few rare cases, this router can cease to work unexpectedly so make sure to keep an eye on it. Does an excellent job filling in weak or dead Wi-Fi spots. Can be up and running in as little as 5 minutes. Offers greater speed to all devices on the network. In some instances it can stop working after a short period of use. Customers can sometimes experience difficulty setting it up. If you're looking for something small and easy to set up, this extender is a great option. It also has a great design, so it won't be an eyesore in your home. This robust Wi-Fi extender is a top pick when you're looking to gain impressive speeds across a larger coverage area. Professionals and other people alike have found this to be a smart option for those who expect a lot out of a Wi-Fi extender. This DAP-1650 offers dual-band, completely wireless- AC compatibility in a compact design. The two bands on this DAP-1650 are made up of a 5GHz band (up to 867Mbps) and a 2.4GHz band, middling out at 300Mbps. This creates a throughput of up to 1200Mbps, which is more than enough for many households. At around $90, this device is a bit cheaper than other options, making it friendly to those who want impressive speeds and savings. Furthermore, this flexible little machine offers an easy setup process as well as four Gigabit ports for Ethernet for connecting wired devices. You'll also be able to share your music as well as video and any other files on the network using the media server options available. With zero external antennas and an overall great console design, there are few downsides to what this DAP-1650 offers. One downside is this DAP-1650 broadcasts on the very same band it uses when it connects back to your router, which can compromise the coverage area and sometimes create a slowed connection. Extenders with multiple bands remedy this problem through connecting and broadcasting on separate bands, because it allows them to easily connect to a router with one and broadcast with the other. While it isn't a huge problem, there can be a few small issues with the router trying to connect with the extender using the exact same band the extender is broadcasting with. There have been cases when the signal from this extender didn't carry the strength or speed expected. Fills in dead or weak spots with a stronger Wi-Fi signal. Creates a stable, reliable signal throughout your home. In some instances, customers don’t see the kind of increase in speeds that they were expecting. This extender can sometimes gain or lose connection without apparent cause. If you live in a larger home and need to extend the range of your router to fill up any weak or spotty areas, this is an excellent choice. This NETGEAR Nighthawk AC2200 X4 WiFi Range Extender is an easy, plug-in extender that can help to allow the whole family whether they are gaming or streaming content without the worry for interruptions. It's able to allow multiple devices to use services at the very same time through the addition of Multi-User Multiple Input, Multiple Output (MU-MIMO) technology. Using this sophisticated technology, everyone in the house will be able to communicate, stream, browse and game easily. In addition, this dual-band extender uses beamforming technology to offer better internet speeds and capabilities. While using the Nighthawk X4 AC2200, you'll be able to get 1,733Mbps with your 5GHz band as well as 450Mbps on your 2.4GHz band. It's a snap to install, allowing you to reach higher speeds in only a few short minutes. Rather than using broad spectrum, the Nighthawk X4 AC2200 can send data straight to clients, ensuring a better connection. While it might be a little larger than other options, the Nighthawk X4 AC2200 has a great look and an antenna array placed internally rather than external to increase the aesthetically pleasing nature of the device. You'll also love the ability to get it running in no time at all. There can be cases where the signal may drop unexpectedly. Offers excellent coverage for all devices in your home. Fantastic for filling in spotty areas. Some customers have trouble connecting the extender to their router. In some instances, the connection may be unreliable. If you're looking for an extender with the added benefit of MU-MIMO technology, look no further! Though it may have somewhat of a complicated setup process, this Linksys RE6500 can offer a lot more coverage area than other options. However, if you have a knack for networking and want something that comes with extra security features, this is a solid choice. While it may be a bit pricier than other options, the RE6500 offers impressive performance and 1200Mbps of powerful throughput. Due to its Wireless-AC compatibility, the RE6500 is able to extend your home's wireless coverage space by around 10,000 feet, which is quite a big deal. Unlike other options, you'll also get the benefit of an audio input jack that is perfect for when you need to connect a speaker or stereo system. That capability will allow you to wirelessly stream your music whether it's from a computer or mobile device. The Linksys RE6500 also offers WPS(Wi-Fi Protected Setup) and a 128-bit encryption for added safety. These features really make the complicated setup process worthwhile, because they add safety to what is already a decent Wi-Fi extender. If you need to use a device as a wired access point, this device also offers 4 Gigabit ports for Ethernet to assist you with that as well. Overall, whether you live in a large home or need a greater range for a small business or office, the Linksys RE6500 is a great way to go. Here is our selection of best Linksys Routers you can buy. It's important to handle this extender with care because the antenna can be very fragile. Provides plenty of bandwidth for multiple devices. The antenna on the device can be very fragile. Some customers have experienced it overheating. If you have a decent amount of technical knowledge and want a device that can cover a great deal of space, then this extender is a fantastic option! If you need your Wi-Fi to reach all the far corners of your house, but your router seems to be lacking the signal strength then this extender is one of the best options out there. Whether you need to boost your streaming or gaming abilities, it's highly worthwhile to consider the TP-Link AC1750 Wi-Fi Range Extender. It's a relatively simple device that you can plug into a wall outlet to get going. This dual-band extender is capable of offering good signal range and decent speed for browsing, streaming and gaming sessions alike. The RE450 is able to offer solid throughput speeds of 1,300Mbps on the 5GHz band and 450Mpbs on the 2.4GHz band, which is decently higher than other options. Especially if you need the signal to function for long distances, this device can keep you covered. The TP-Link AC1750 is a fantastic device that can offer solid performance whether you're using it for a computer, gaming console or smartphone. While it does lack a pass-through outlet, it's sure to provide a great wireless network at the maximum data rate. In conclusion, if you're a frequent streamer, you really can't go wrong with the RE450. There have been a few cases where the extender has stopped working after only a small amount of use. Not known to drop the connection frequently. Some customers can have trouble getting the extender to connect. In some instances it may not extend the signal as far as desired. If you're looking for something especially great for those who stream often, the AC1750 is a fantastic choice. It's not uncommon for people to need something that can add a better range to their routers. If you aren't looking to spend the money on a full mesh-network system then using a Wi-Fi extender to add an extra access point can be the way to go. Without a doubt, the top networking device in this article is the NETGEAR AC750. It's capable of extending your home's wireless coverage area so that you can get rid of any spotty Wi-Fi areas in your home. However, if you're keen on something that offers MU-MIMO technology, it's also worthwhile to take a look into the NETGEAR Nighthawk X4 AC2200.